Victoria Educational Gardens consists of 19 mini-gardens and various garden structures for the enjoyment and use of the public at 333 Bachelor Drive across from the control tower at Victoria Regional Airport. The gardens and adjoining facilities can be reserved for your next special occasion. The VEG Pavilion, shown here decorated for the holidays, can be used for meetings or events throughout the year and during the holidays. 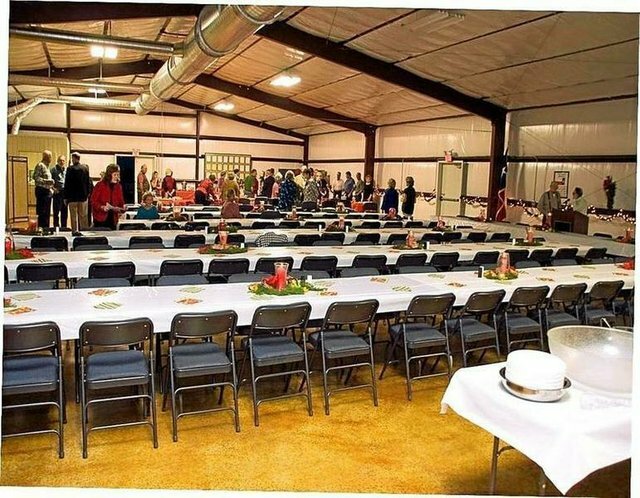 ﻿﻿﻿﻿﻿﻿Tables, oblong or round, can be placed in various configurations inside the VEG Pavilion depending on what is needed for your event. 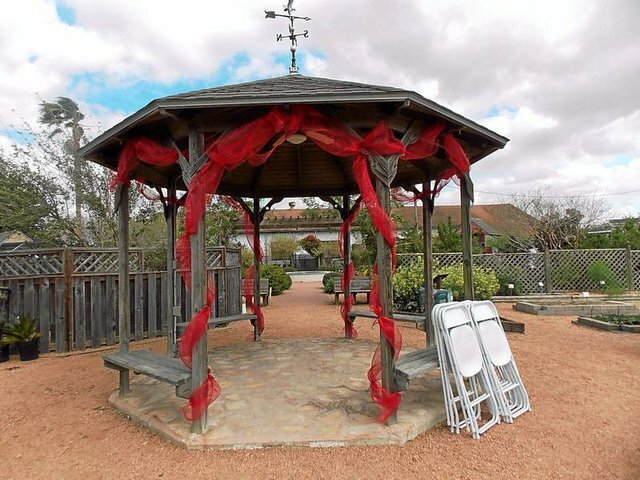 The tea room gazebo at Victoria Educational Gardens has been an authentic outdoor setting for several weddings. 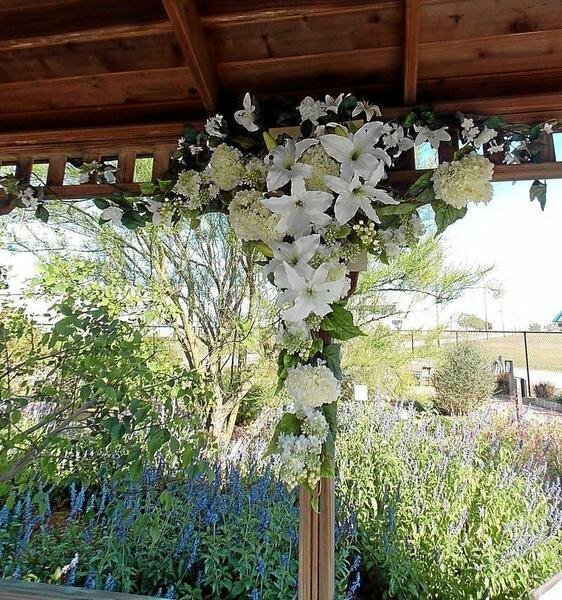 The covered rose arbor leading into the east side of VEG is shown decorated for a wedding entrance. The gazebo between the pavilion and the Officer's Club at VEG is shown decorated for use for a special occasion. The VEG pavilion has been the indoor site for dinner and dancing at a quinceanera celebration. Has anyone ever told you something and then asked you not to tell anyone else about it because it was a secret? Well, it seems that there's a place in Victoria County that has been somewhat of a secret for a long time in the Crossroads area, but not anymore. It is getting more known all the time. 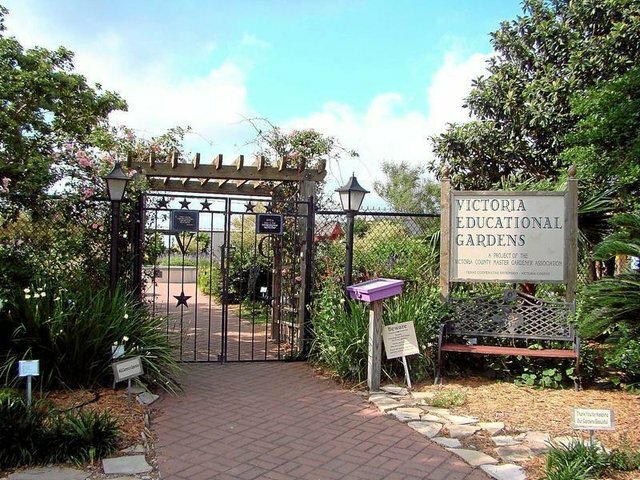 Victoria Educational Gardens is that best kept secret in the county, although some of our regular readers may disagree since it is mentioned in this column frequently. Even if you knew it began some 10 years ago, did you know that there are facilities at the site that can be used for meetings and special occasions? You would be amazed at how many have said, "I never knew such a lovely place was here in Victoria. When did it open?" And then when it becomes known that the gardens and adjacent facilities can be used for events, it becomes more of a destination to see. How can I find the gardens? For those who are not familiar with the location, the gardens can be found diagonally across from the control tower at Victoria Regional airport. From U.S. Highway 59 at the entrance of Victoria Regional Airport, look for the control tower toward the backside of the airport and head that way. VEG is open daily from dawn to dusk at no charge to the public. There are 19 mini-gardens with various structures that comprise VEG on more than an acre of land surrounding the historic Officer's Club building. There is also a more modern enclosed pavilion on the opposite side of the complex. Four different children's gardens surround a central water feature as you enter the main gates on the west side of the original Officer's Club. To the right of that area are the decorative gazebo, vegetable gardens and greenhouse. Beyond that is the recently built VEG Pavilion. Moving alongside the storage facility and past the patio you will stroll through a beautiful, shady rose arbor that leads from the original gardens to the east expansion site. As you step out from the arbor, daylilies will greet you from both sides. The path will meander past various features, such as a meditative labyrinth, cathedral arbor, several pergolas designed by our own Ed Gregurek from the original Master Gardener training class, the amazing koi pond with its waterfall and bridge, a beautiful tearoom gazebo, a Zen garden and the military honor garden fronting the raised patio on the east side of the Officer's Club. From this description alone, imagine what else you might see when you visit for your own enjoyment or to inquire about the facilities for your personal or organization's use. If you happen to visit Monday or Thursday morning, you will see Master Gardeners busy weeding, planting, watering or caring for the numerous foliage and flora that make these gardens the educational and pleasing site they are. If you have questions about one thing or another while there, any of the Master Gardeners would be glad to answer your inquiry - or find someone who might be able to do so. We are not masters of it all, but we learn from each other's expertise. That's what is so great about the Master Gardener organization. The two buildings on the property, the old Officer's Club with its patio and the newer pavilion that opens to the complex, are available for use with access to the gardens. 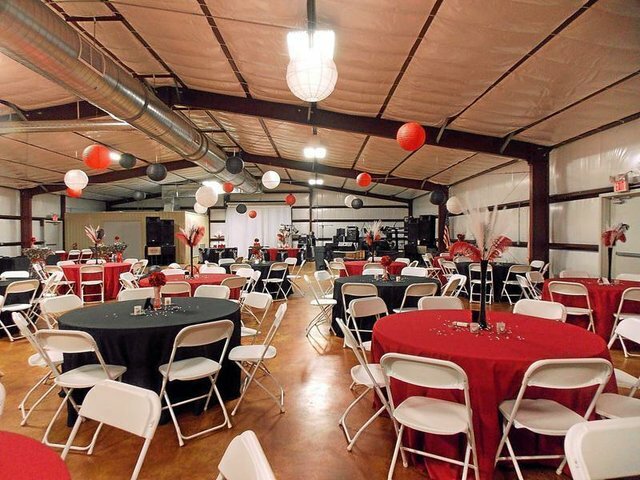 Weddings, receptions, graduation, special birthday and anniversary parties, to mention just a few, have taken place in one or the other of the venues at VEG. Seminars, business/group meetings, luncheons, Christmas parties as well have found the buildings suitable and reasonably priced, besides having the gorgeous surroundings of the landscaped gardens to view and enjoy. 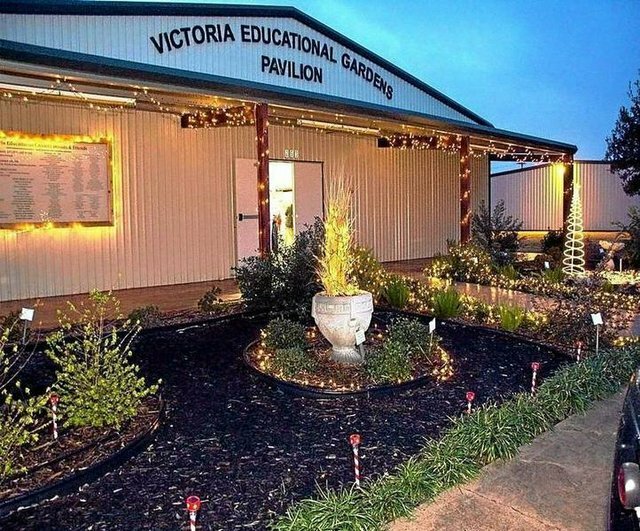 Inquire or reserve any of these venues by calling the Victoria County Extension Office (575-4581) Appointments can be made to preview the gardens and buildings before making reservations. Photographers have often brought their clients out to the gardens for professional portraits, ranging from bridal, graduation, family and quinceanera photos, because of the variety of stunning backgrounds found there. It is a wonderful place also for the amateur photographer to discover the wonders of nature. No matter the reason that brings you to Victoria Educational Gardens, don't keep it a secret. Share it with everyone you know, so that all in this growing community become aware of the amazing treasure that can be theirs to enjoy. Most of all have a wonderful time visiting VEG over and over again because each time you go, the Master Gardeners will likely have something new blooming or growing according to Mother Nature's plan. • For more information: Call Texas AgriLife Extension Office at 575-4581. Drive out U.S. Highway 59 N. from Victoria; turn left on Foster Field Drive. Turn left at circle onto Aviation Drive. Turn right at Piper Street, turn left on Hanger Drive; follow around to Bachelor Drive. VEG, the Officer's Club and the VEG Pavilion are on the left.